As you may be aware, the Nirmukta community has grown a lot over the past year, much of the growth happening in the various Regional Facebook Groups. Also on facebook, our national Nirmukta group, the Indian Atheists page and the Indian Atheists Debate Corner group are very active these days, bringing freethinkers together. This post is to announce that four new Nirmukta Groups and a long overdue official Nirmukta Page have now been launched as part of our community network on facebook. The images on the left are clickable. 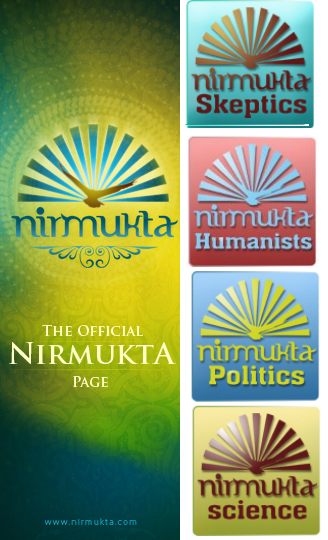 Nirmukta Skeptics: The purpose of this group is to discuss all sorts of events and ideas from a skeptical perspective, using the tools of science to evaluate dubious claims and expose the pseudoscientific ones. Nirmukta Humanists: This group is for those atheists and freethinkers interested in discussing morality, ethics and all sorts of issues involving social rights and justice. Nirmukta Science: This group is for atheists and freethinkers interested in posting and discussing science-related links, book suggestions, videos, documentaries and articles. The group is also a place for discussion on the scientific method and philosophy of science. Nirmukta Politics: This group is for those atheists and freethinkers interested in discussing political events and ideas in a secular and rational framework. Credit for the customization of the Facebook Page goes to Lalit Mohan Chawla for the coding and Bala Bhaskar for graphic design. Bala also designed the logos for the new Facebook Groups. The new official Nirmukta Page has far fewer members than the Nirmukta FB group as of now, but it will become Nirmukta's main outreach page on facebook. Several new features have been added to this page, including a custom landing page and tabs that extend functionality. Please be sure to check them out. 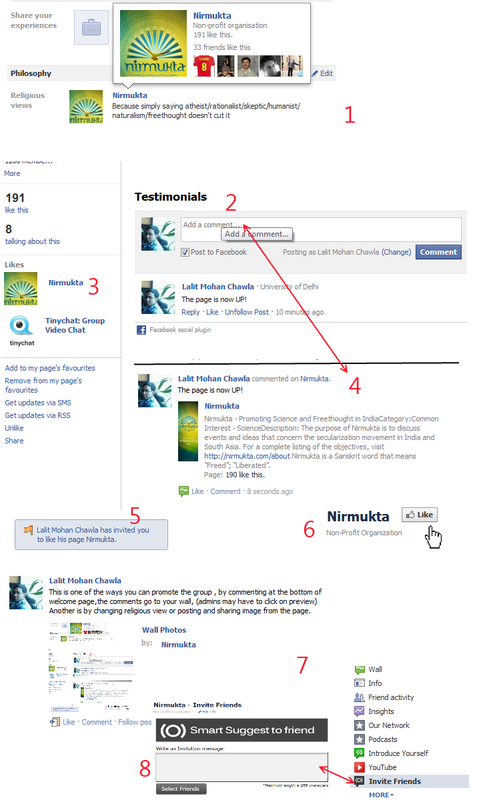 Eight ways you can promote the Nirmukta FB Page. 4) Share it (see # 2 in the image) on your profile (check post to profile while commenting in testimonials). 7) Post and share images or share the image below.